Thousands of flats of strawberries are sold each year at the annual fruit fest. It’s the berry best. Just east of Tampa there’s a festival that celebrates being the self-proclaimed “Winter Strawberry Capital of the World”. For 11 days every year Plant City throws a hoedown at its fairgrounds to celebrate the annual local crop harvest. It’s filled with food, rides, concerts, cooking demonstrations, and a parade. It’s gotten so popular that the entire county gets a a school day off to celebrate. It’s all about that sweet red fruit. If Forest Gump were here he’d articulate all the ways strawberries can be used. There’s shortcake, upside down cake, pie, muffins, and strawberry pina coladas. There’s strawberry elephant ears, strawberry flavored lip gloss, strawberry jam, jelly, and butter… you get the drift. If it can be done with a strawberry, it's done at this festival. There has always been a hometown feel here. Folks are friendly, musically the festival features great country music artists as well as other popular bands past and present, and there's no alcohol served. It's a family-friendly environment for kids of all ages. Lines at the shortcake vendors can be long, but go amazingly fast. We are standing outside the building at the St. Clement strawberry shortcake concession and the line goes inside and wraps around the entire shortcake booth. There is a sign on the floor that says “4 minutes from here”, and there are easily 40 people ahead of us. It is actually five and a half minutes before we are dishing up that sweet strawberry goodness. It's very impressive. BTW- cash only! In the strawberry shortcake construction line at the St Clement Catholic Church booth, hungry eaters select the base of shortcake or biscuit and then proceed to build their own. Attendants at the end of the line (in green) place a final “capper” berry on the top and it’s time to eat! Okay- how much whipped cream should I have? The dish is a pretty good deal! $4 gets you all you can fit into one bowl. Want lots of berries? No problem. Prefer to pig out on whipped cream? Take all you can fit! Here’s what all the fuss is about. Fresh strawberries top a homemade biscuit (half) with whipped cream and a whole fresh strawberry on top! No, there were no leftovers. After eating it's time for photographs. The midway proves as photogenic as ever. I give myself an assignment to capture the frenetic energy of the festival, and the rides and people did not disappoint. The idea at this booth was to simply hang on to the bar for 2 minutes. It’s just 2 minutes… easy right? For $5 and 2 minutes hang time winners get their choice of t-shirts. Did this guy make it? Nope. He dropped with 43 seconds left. Rumor has it that the bar actually spins freely. Thus if you lose your grip and try to grab it again it slips out of your hand. Night photography at fairs and festivals is especially pleasing. With a cloudy sky and a setting sun there can be some dynamic images made. Here's what I saw. The setting sun creates glorious light behind the thick clouds. It's hard to say which show was better. Lights, people, movement, and energy; It's the perfect formula for dynamic photographs. “Want a prize? Pick your size! Winner every time” says the raspy voice over the PA system at this game where players shoot water at a target which inflates a balloon. The first balloon to pop wins! The Midway is filled with the screaming voices of carnival ride riders having their hair and stomachs turned while being flipped, inverted, and thrilled. Claustrophobia has no place here on The Zipper. Ticket holders are placed in seats behind a large padded cage door that locks them in. It makes sense that the seats would need to be a tight fit. Look at that ride in action! Yep, this one flings you sideways and backwards. It's hard to tell if the screams from the riders are from fear or jubilation. Ever wonder what it would be like to be on an elevator 15 stories up and have the floor drop out of it? Try this ride. Pay some money, get strapped into a chair, and get lifted about 60 feet (my estimate) in the air. There will be a brief pause and the next thing you know you are hurtling towards Earth at an untold speed. No corn dogs before this ride! 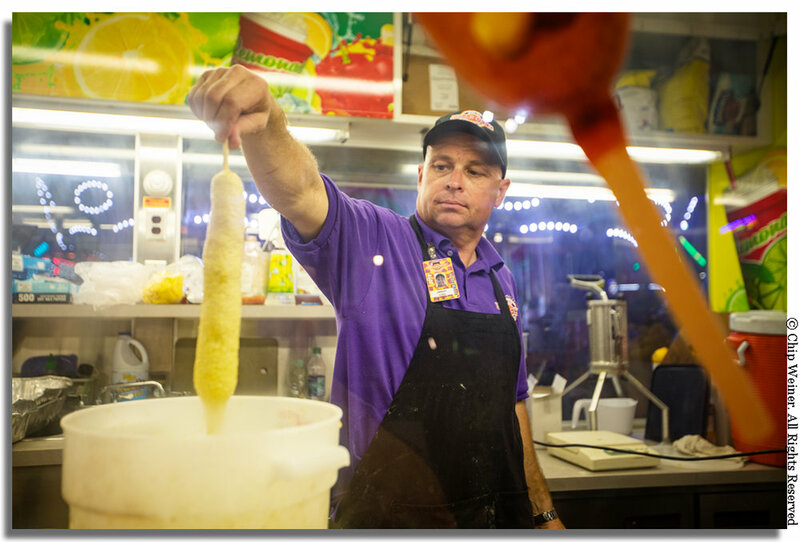 Speaking of corn dogs, what's a fair without a foot-long? Jason Zokka with Potopas Concessions dips a 12 incher in batter before dropping it into the deep fryer. Yes, I did as a matter of fact… with a little mustard. There's just so much to see here. I can't take it all in. Besides the shortcake and the rides on the midway, there are agriculture and horticultural exhibits, photography contests, pig races, and even a Strawberry Queen competition. If you missed it this year, don't fret. It'll be back next year. Take the kids or your camera. But, go hungry!